I was able to get this image earlier this year during what was supposed to be our big ice event but turned out to be mostly rain. 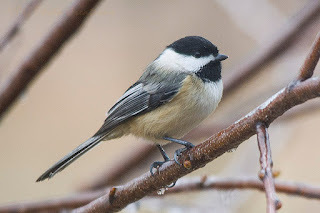 This Chickadee sat long enough for a photo. It was nice as they are usually constantly moving so getting them to pose can be difficult. It was perched in the River Birch and this is shot through a couple of panes of glass so I am pleased with the clarity.